Everything you need to create an easy and romantic Valentine’s Day Dinner at home! From what to serve to a charming table setting. We’re sharing all the details! My husband and I love going out for a romantic dinner. There is nothing we love more than a quiet evening at a hip restaurant, chatting over delicious cocktails and food. BUT we never go out on Valentine’s Day! Personally I think it’s the worst day to go out to dinner as it’s normally overpriced fixed menus and crowded. Valentine’s Day is actually a great day to make a delicious, romantic Valentine’s Day dinner at home! 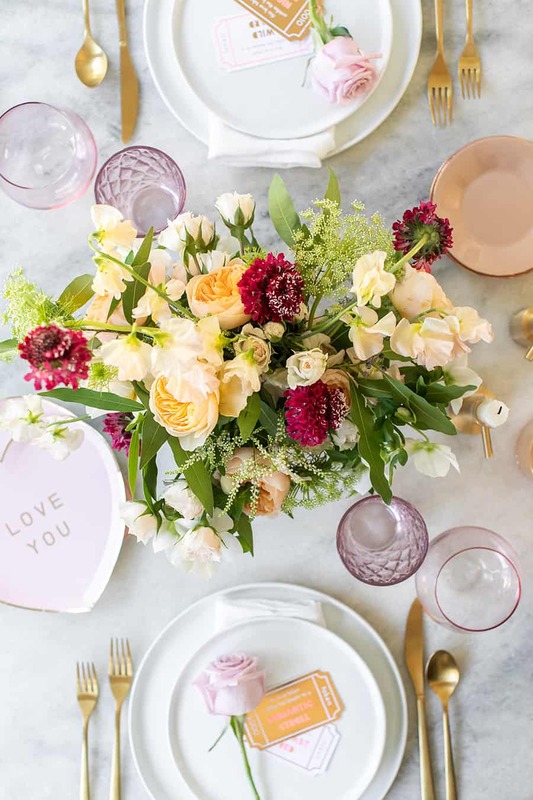 Below I’m sharing some easy Valentine’s Day dinner recipes and a very charming table setting for a charming Valentine’s Day dinner! What Should I Make for Valentine’s Day Dinner? 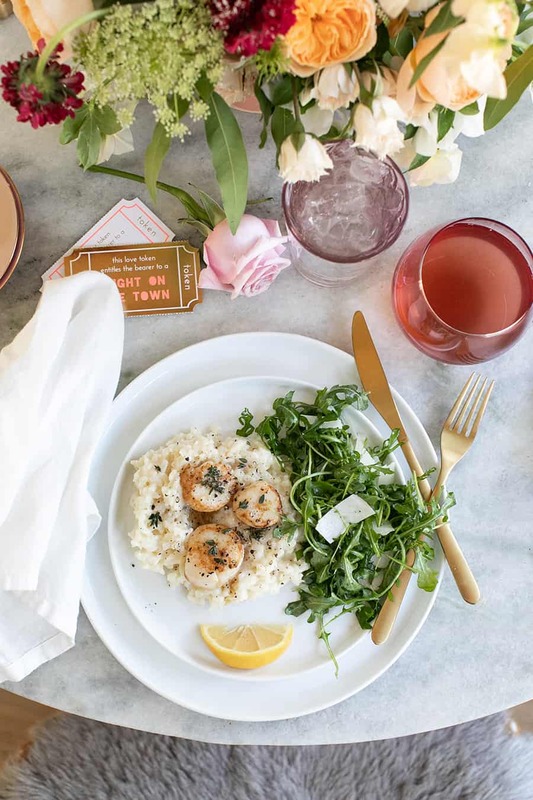 For a romantic Valentine’s Day dinner, you want it to be different than the casual dinners you make during the weekday, but nothing too complicated and hard. 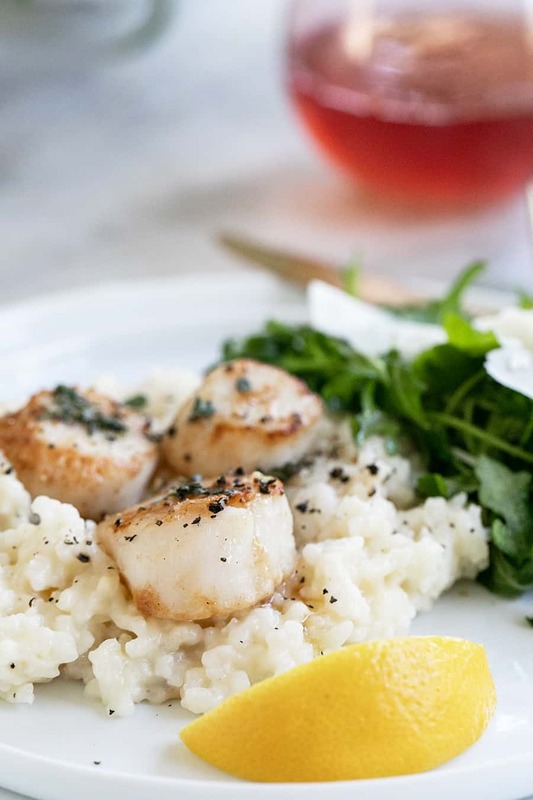 Making a creamy parmesan risotto, scallops and our very easy arugula salad is a the perfect easy Valentine’s Day dinner. It’s elegant, but also very achievable to make, even if you’re new to cooking. Making scallops seems intimidating but they are simple! 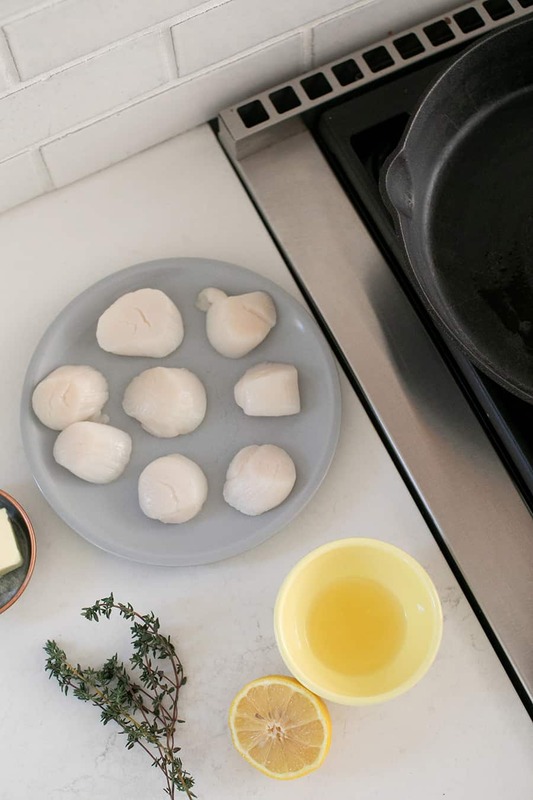 We followed this recipe from Bon Appetit on cooking brown butter sea scallops. They’re cooked over a cast iron pan with some butter, lemon juice, salt and pepper and go very well plated with the risotto. If you don’t have a cast iron pan, I suggest buying one. Not only will you have it for the rest of your life, they’re very affordable and we use ours all the time. Even for cakes! 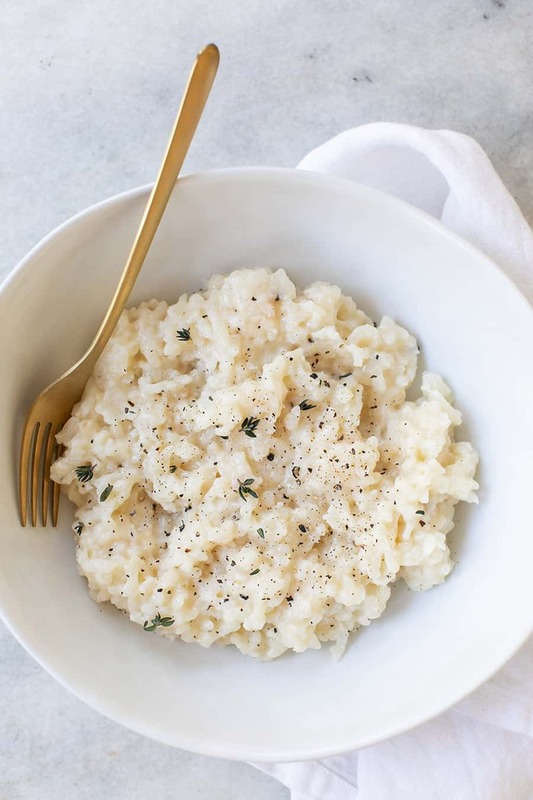 The risotto is one pot and the easiest risotto you’ll ever make! Serve it with a bottle of rose and you have a very easy Valentine’s Day meal! Also, see our guide to rosé. For the table setting we purchased some pink glasses from World Market and brought out our gold flatware! 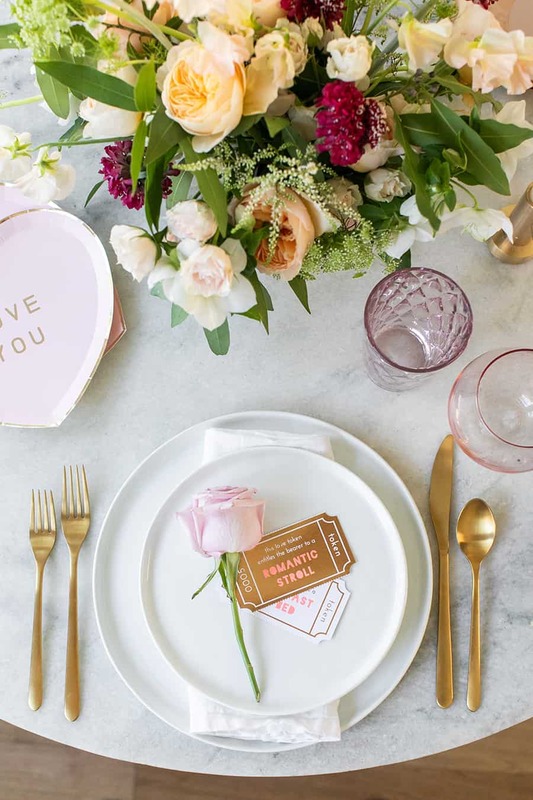 The paper heart plates add charm and are perfect for serving dessert. 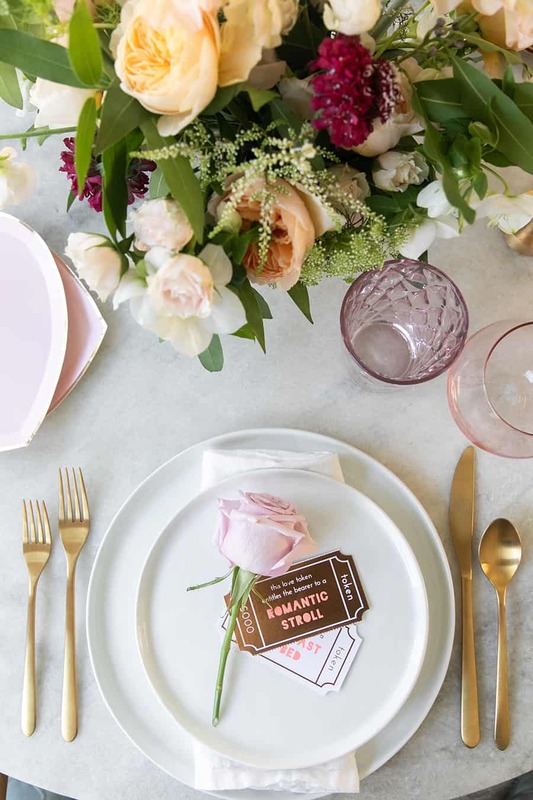 If you need help setting the table, here’s a guide to setting a charming table. 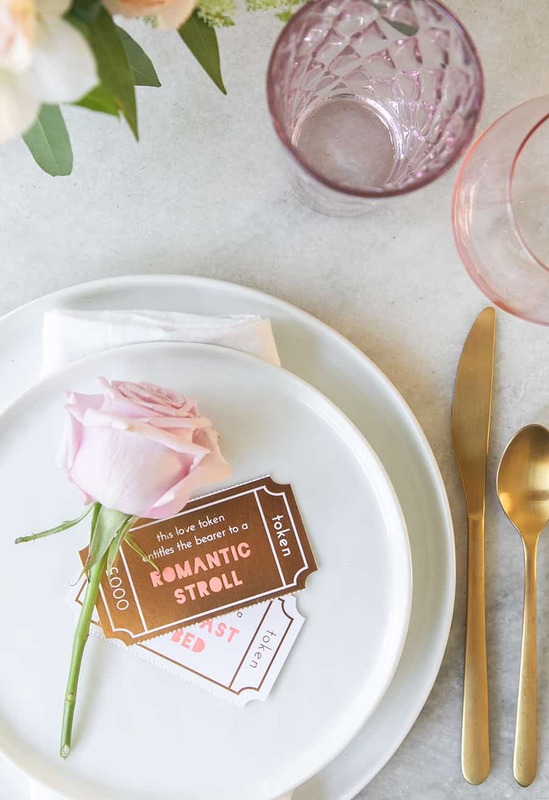 I couldn’t resist adding these charming Valentine’s Day tokens to the table setting. They’re such a fun Valentine’s Day gift idea! We also have some silly ones you can download and print for free! I had my friend Erin make a pretty Valentine’s Day floral arrangement in this very affordable pink vase. 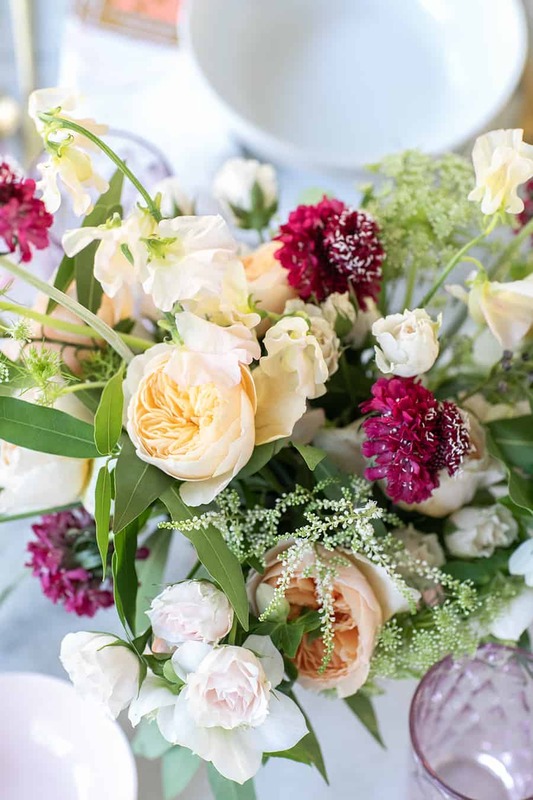 Flowers always add instant decor! 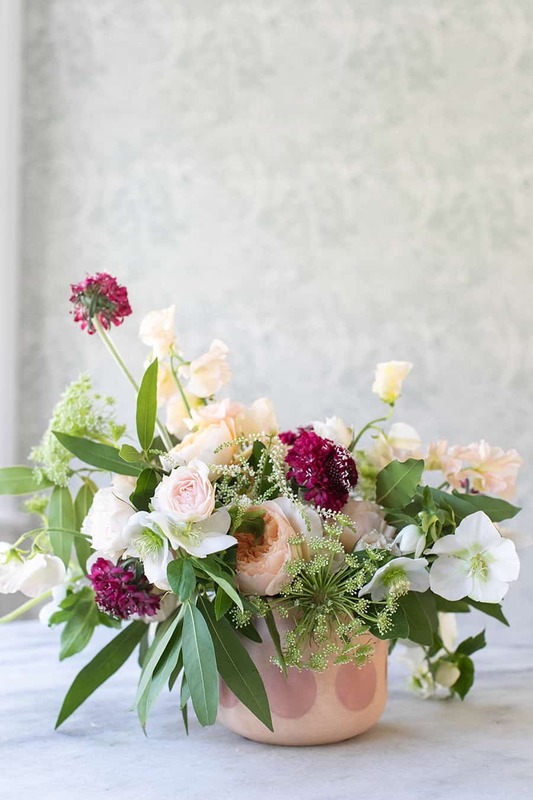 Here are some tips for arranging your own flowers. My favorite part of the meal is dessert! 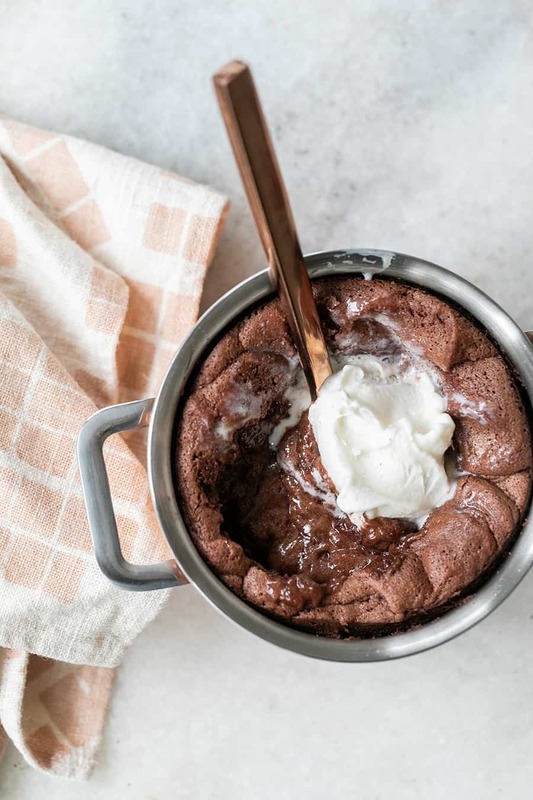 Try our decadent chocolate soufflé for two! If you also want to serve a cocktail, try this beautiful rose water and gin cocktail! It’s very romantic with a homemade rose simple syrup! I hope this inspired you all to cook a lovely meal for you, your partner or friend! Happy Valentine’s Day! I noticed you used a cast iron pan for this dish – can you please do a post on what you do regarding seasoning and taking care of your cast iron pan? I have one but haven’t used it yet as as I have had some conflicting info on how to do this… and I am too scared to try! Thanks Eden – you are a gem! I will try this on the weekend.